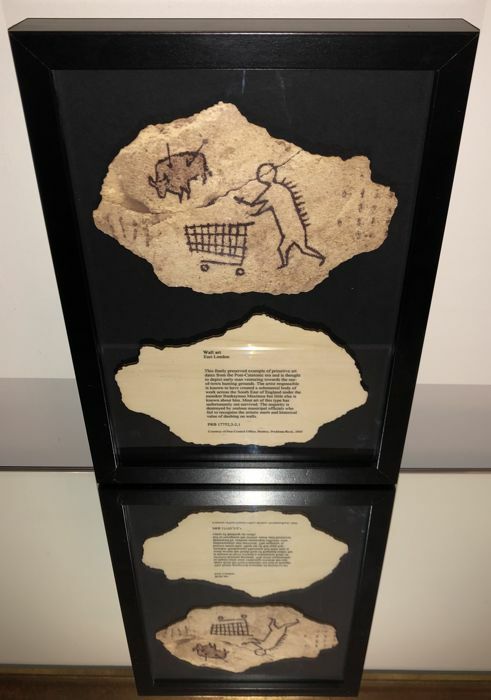 X2 Peckham Rock printed in colours on cardboard with the Courtesy of Pest Control Office of Banksy tag on the verso. Released for the opening of the I Object exhibition sold for a limited time only, already sold out. 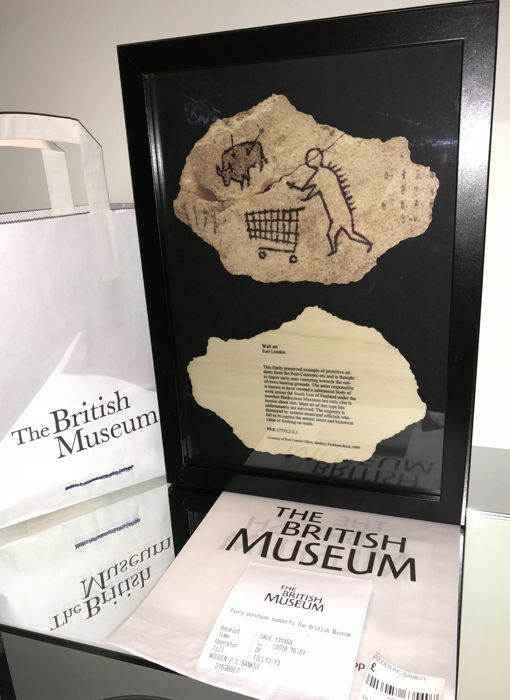 Sold with the receipt, tag, cover, and paper bag from the British Museum. 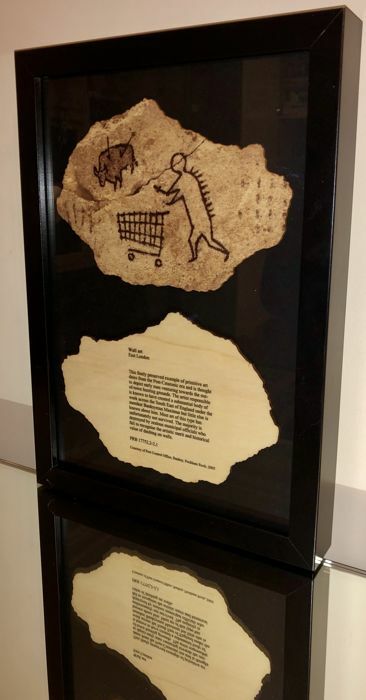 Both are sold with a professional frame. Size: frame: 33 x 24 cm (13 x 9.5 inches), without frame: 18 x 12 cm (7.1 x 4.7 inches) each. Edition: Sold for a limited time only, already sold out. Recently (October 6th, 2018), the Banksy artwork Girl With Balloons was the subject of a world price record at Sotheby's auction with a hammer price of 1150000£. 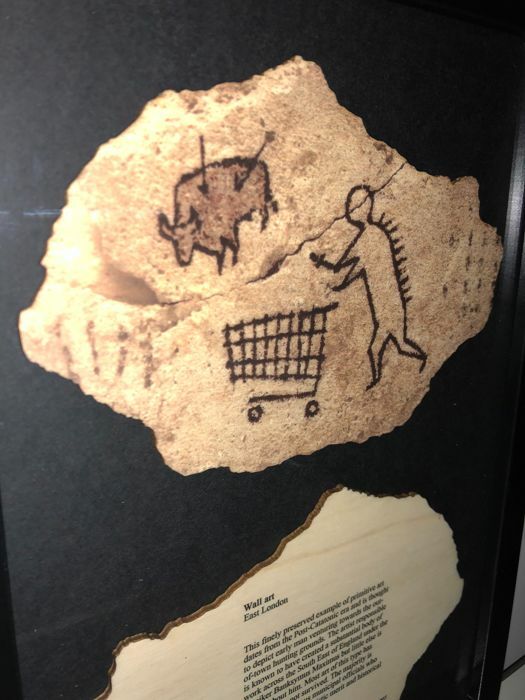 The Peckham Rock is a Banksy historic piece that will increase in value with time. Shipping: Well packed parcel with tracking and insurance, delivered against signature. 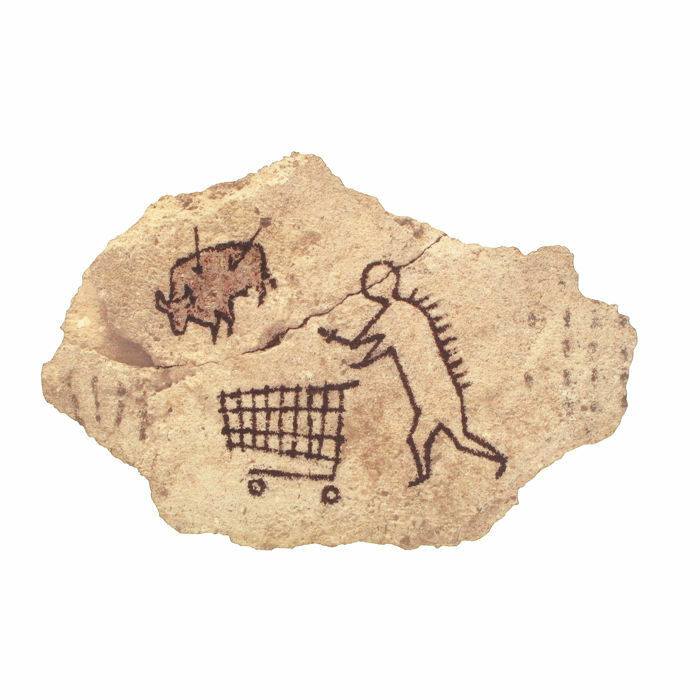 Banksy’s ‘Peckham Rock' is a piece of concrete showing a supposed prehistoric figure pushing a shopping trolley. 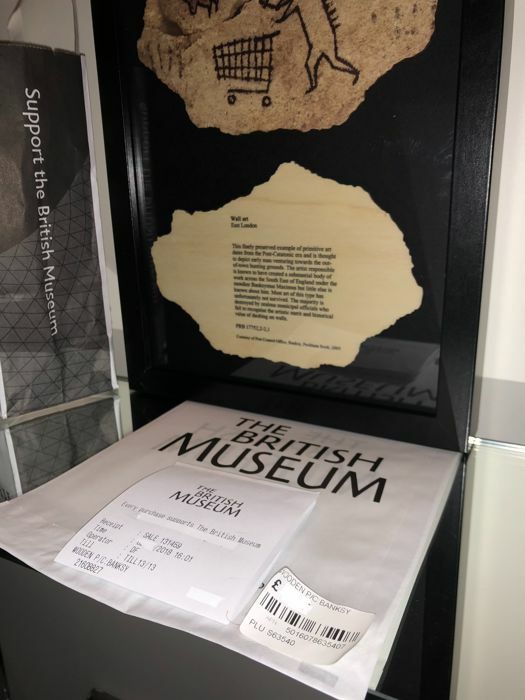 This was placed in The British Museum in 2005, accompanied by an authentic looking information label and was there for three days before anyone realised something was amiss. Arguably the most controversial street artist in the world, Banksy has developed an entire art subculture devoted to his works. Banksy’s art can impact any location at any given moment. His identity remains unknown, even after over 20 years of being involved with the graffiti scene. He has worked with many different types of street art media and street art types. His work not only includes many powerful, often controversial images, but they may also be found throughout the Internet as viral images. Banksy began his graffiti art lifestyle by admiring the works of Blek Le Rat and often recycling his old ideas. He has been very active in the graffiti scene since the early 1990s. Banksy is from the same batch of urban artists as Shepard Fairey (Obey), Ben Eine, Pure Evil, Ludo, Rero, C215, Jef Aérosol, JR, Swoon, Orlinksi, Speedy Graphito, Vhils, Ming, Ferrari, Rolex, Piguet, Ernest Pignon Ernest, Picasso, Atari, Panier, Hirst, Koons, Vu, D Face, Ron, Murakami, Shrigley, Polock, Koons, Dubuffet, Matisse, Delaunay, Buffet, Kapoor, Wesselmann, Dine, Hockney and Os Gemeos. Initially, he hung around a graffiti crew in Bristol by the name of DryBreadZ crew or DBZ. Soon after, he teamed up with Inkie, another notable graffiti street artist. By the age of 18, Banksy began to develop stencils after nearly being caught vandalizing public spaces by the police. As his crew fled from the scene, Banksy was stuck hiding beneath a garbage truck. It was at this time that Banksy saw stencil letters on the truck. Looking for a faster way to paint, Banksy decided stencilling would be his new graffiti type. The most common form of street art Banksy uses are stencils. These are often in the form of multi-layered stencils and/or combined with other media sources, such as spray-paint. He also includes anything found in the streets like street signs and other objects to convey his message by crafting beautiful street art installations. His artwork is often satirical and combines dark humour with graffiti and also spreads messages across art, philosophy, and politics. By the early 2000s, Banksy relocated to London, where he began to gain notoriety and even worked on a series of international exhibits. Eventually, he decided to travel to Palestine and the West Bank, where he stencilled nine images on the Bethlehem Wall. These images were an instant hit and virally exploded in the Internet. At this time, Banksy’s silkscreen prints and stencil paintings were racking up record-breaking sales in art auctions such as Sotheby’s and Bonham’s of London. These successful sales officially broke him into the commercial business. In 2010 Banksy became a successful author and filmmaker for the film ‘Exit Through the Gift Shop’. Banksy is one of the most popular urban artist and sells in the most popular auctions in the world alongside Seth, Basquiat, Miss-Tic , Mr Chat, JonOne, Zevs, Dran, Stik, Mr Brainwash, Kaws, Roa, Blu, Dolk, Toy, Bearbrick, Ai Weiwei, Dali, Hartung, Francis, Roy Lichtenstein, Haring, Combas, Warhol, Mesnager, Levalet, Blek Le Rat and Brusk. Very little is known about Banksy himself, as he refuses to be interviewed and keeps his identity. A world-renowned mystery man, Banksy has risen through the ranks to become one of the world's greatest street artists partly by creating an urgency to understand his character. Street art fanatics are consistently satisfied with every piece of art he delivers, though he often leaves them wanting more. 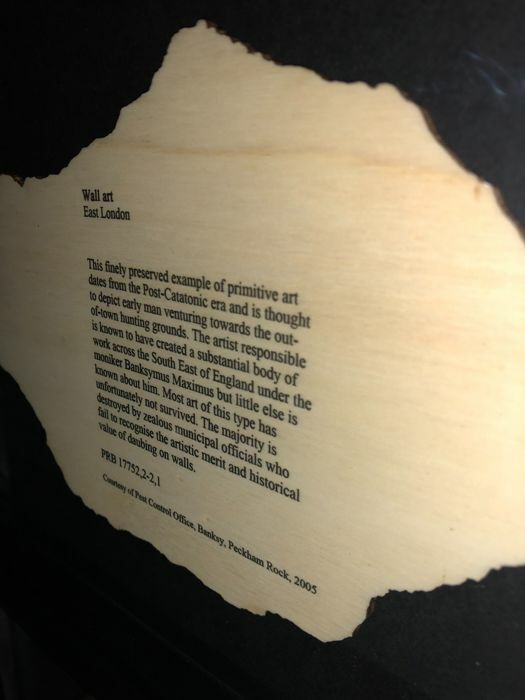 This tactic carries one's curiosity to explore a completely new perspective or idea, leaving his artistic creations to inspire beginning and advanced artists. This inspiration is also known as the ‘Banksy Effect’. The media and his supporters have always questioned Banksy’s identity due to a variety of identity claims. 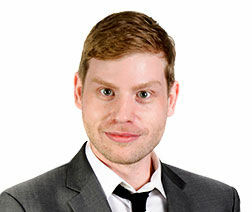 Most recently, many popular theories, including an entire newspaper publication, pointed his identity at being a Bristol native by the name of Robin Gunninham. If this is theory holds true, it will allow even greater insight into the artistic world Banksy inhibits. What is even more interesting is that he has managed to completely conceal his identity from his family. To this date, no Banksy identity claim has ever been definitive. In Summer 2015, Banksy organised a temporary art project called Dismaland, a dystopian theme park built in the seaside resort town of Weston-super-Mare, in England. Prepared in secret, the project unveiled 10 new works by Banksy and the pieces from 58 other artists. Banksy’s artwork has been seen across the world. His travels have included Australia, England, the United States, Israel, Jamaica, and even Canada. Most recently, he spent an entire month glamorizing New York City with his street art, which grabbed the attention of thousands every day. parfait , envoi rapide et soigné , merci ! le produit est arrivé abimé car peu emballé et le cadre n'était pas conforme à la photo de présentation. De plus l'album sensé être joint n'y était pas. Zeer slecht !! Nog steeds niets ontvangen op het gevraagde adres. Al meerdere mails gestuurd zonder positief antwoord. Slechte catawiki ervaring. Ondanks afspaken daarover gemaakt. Gewoon slecht. You didn’t write the right adress on your catawiki account so that’s not my fault but yours. You didn’t checked your shipping adress before checkout. You should modified it now for your next purchase if not the situation will happen again and again.